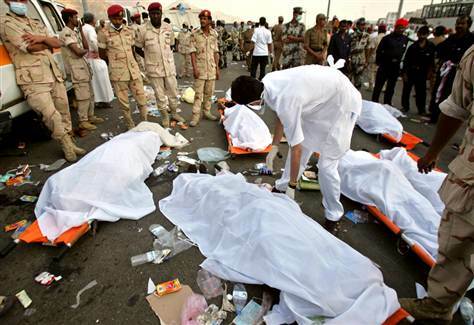 Saudi government sources continue to update the number of people killed during a horrific stampede near tent compounds. About two million pilgrims are expected for the pilgrimage to Makkah. Most victims were from Niger. For Health minister, pilgrims moved “without respecting the timetables,” causing the crush. Riyadh (AsiaNews/Agencies) – At least 717 people have been killed and about a thousand wounded in today’s horrific stampede near the holy city of Makkah during hajj. Saudi authorities have been constantly updating the figure. It is not clear why the incident occurred, but Saudi officials suggest that a surge in the number of pilgrims heading towards the Jamarat Bridge might be the cause. According to tradition, pilgrims come to the bridge on the last night of the pilgrimage to throw seven stones at pillars called Jamarat, which represent the devil. The authorities dispatched about 4,000 rescuers and 200 ambulances; however, the tent camps, and the huge flow of people complicated relief efforts. During hajj, one of the five pillars of Islam, Makkah is decked to welcome huge numbers of pilgrims. The Saudi Civil Defence Directorate said that the stampede occurred at around 9 am (6 am GMT) at the junction of Street 204 and Street 223, about 5 kilometres from Makkah. Although the area is heavily policed, as pilgrims walked towards the five-storey structure that surrounds the pillars, known as the Jamarat Bridge, there was a "sudden increase" in the number of people moving towards the site. According to the authorities, this is the deadliest incident to occur during the Hajj in 25 years. Saudi Health Minister Khaled al-Falih said the crush occurred because pilgrims moved “without respecting the timetables" established by authorities. According to the BBC, most victims are from Niger. Other sources suggest that some 50 Iranians are among the dead. The town of Mina is located along the road from Makkah to the plain of Arafat, where a granite hill stands, Mount Arafat (Jabal ‘Arafāt), also known as the Mount of Mercy (Jabal ar-Rahmah). According to Islamic scriptures, Adam and Eve were reunited here after their expulsion from Eden.